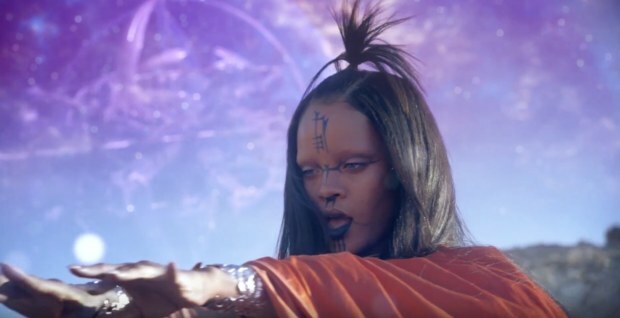 Swooning over Rihanna’s latest “Sledgehammer” video for StarTrek (although her makeup seemingly borrows from fashion icon Michele Lamy), one senses that current trends favor an aesthetic cultivated by the scientific. While video games claimed the hearts of teenage nerds in the 90’s, geeking out is lauded with every new sci-fi program circulated. Swooning over Rihanna’s latest “Sledgehammer” video for StarTrek (although her makeup seemingly borrows from fashion icon Michele Lamy), one senses that current trends favor an aesthetic cultivated by the scientific. While video games claimed the hearts of teenage nerds in the 90’s, geeking out is lauded with every new sci-fi program circulated. 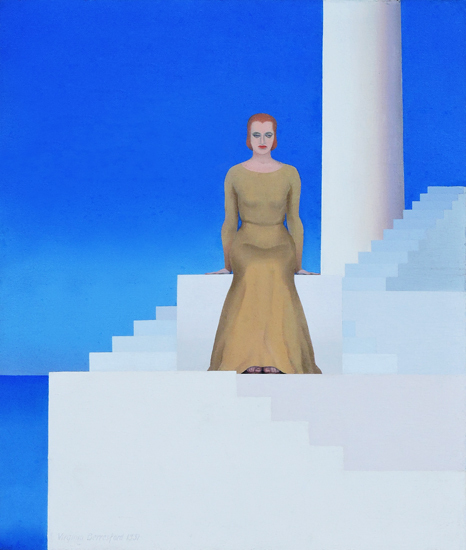 Virginia Berresford, Woman on Steps, Oil on canvas, George Stern Fine Arts. Click to inquire. The repetitive rectangular form composing the stairs seems to evoke a pixelated quality to the work. Both the woman and geometrically rigid background in which she is situated are unnervingly familiar. 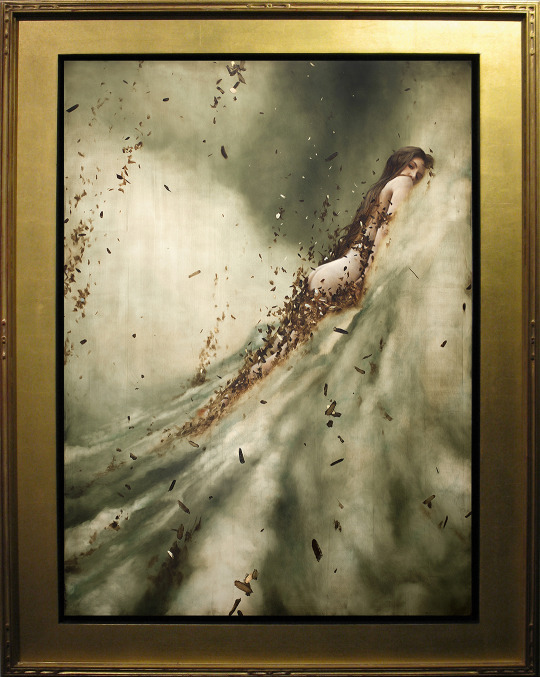 le, Tidal, Oil and gold leaf on board, Arcadia Contemporary. Click to inquire. Kunkle’s subject seems to dwell in the realm of a stormy planet. Now in vogue as a rebooted series, StarTrek fits into a pop culture phenomena where creators, even in the fashion world as exemplified at the Met Gala’s latest theme: Manus x Machina: Fashion in an Age of Technology-have come to acknowledge that daily life now relies on the scientific ingenuities which are not the stuff of imagination anymore. Jeff Gillette, Beach, Acrylic on canvas, Bert Green Fine Art. Click to inquire. 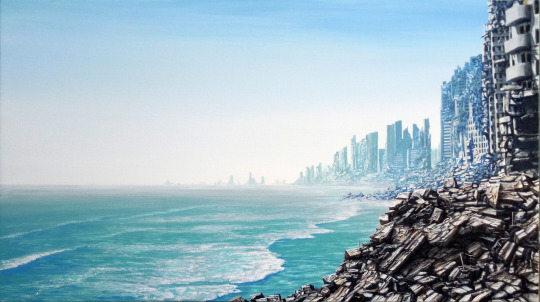 Gillette’s Beach is evocative of a future dystopia. James Rosenquist, Where the Water Goes Colored, Pressed Paper Pulp, Contessa Gallery. Click to inquire. 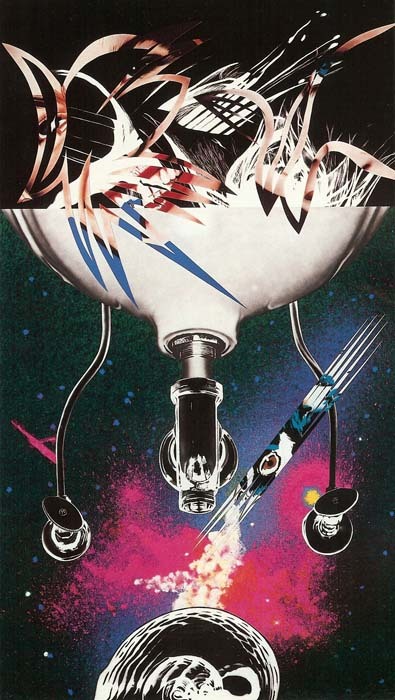 Rosenquist’s work models an imaginative space craft. Fascination with tech’s future potential spans across all time periods. Virginia Berresford’s Woman on Steps from George Stern Fine Arts uses a pictorial technique which seemingly appears pixelated. Like past movies, 2001: A Space Odyssey, etc., art, like works pictured below, anticipates or incorporates technological advances, however outlandish they may be. 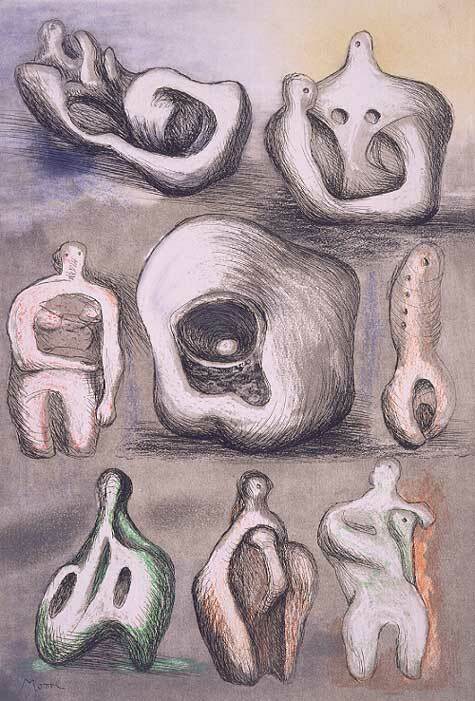 Henry Moore, Eight Sculpture Ideas, 1980-81, Etching and aquatint, Leslie Sacks Gallery. Click to inquire. Moore’s undulating forms float amidst the drawing. Seung Hoon Park, Textus 145-1, Digital print, PYO Gallery LA. Click to inquire. 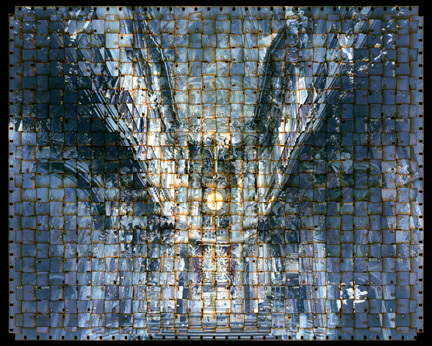 Park’s distorted point of view resembles the metallic scales decorating the gowns of the Met’s recent Gala.